Hi, thank you for your codes! I was wondering how do i edit the codes because i dont need the crop picture function. Can i get your help on this? Hi, thank you alot for your help. I am a student working on a Android Programming Project. I am new on this. Do you mind helping me out with some of my doubts? If you dont mind, do you have an email so I could contact you with? Let me know if you are uncomfortable with it. Thank you. I am not sure but it should work. If you did not get anything in bundle or in data is null you should get image path after capture an image and then try to crop it.. Thanks for sharing. It works! Your welcome, and thanks for positive comment on my post..
but it is not working.I want to change size of output image. these line not for image size it is just for crop image size in 2:1.5 ratio..
because everyone don't have high resolution screen device..
if i increase with my fingers for example if i take completes image the output image doesn't contain whole complete image it is cropping automatically and i am not able to see whole image.And in cropping screen,there are two buttons save and cancel.If i want to change text on them how can i change.please help me. For your first problem for crop image I am not sure what have to do because in my case its working fine. Actually it is totally depend upon your device density. For this I suggest you ask question on stackoverflow.com and if you got any answer please put your answer on my blog so I and my other visitor can take help from you. this is android default behavior we have no any control or we should override OS. well it will be different text and button on different-different devices. Thank you so much and I am waiting for your comment. No I don't think it is possible zoom in after crop image. Better idea don't crop. Just remove crop code hope it will help you. Or search for any android library for crop image in full. i want to know that how that rectangle is coming and how to get size of rectangle. Basically this is Android SDk default behavior we are not going to create any rectangle from our self..
Hi, do you know the reason why i run your app in my android phone (Samsung Galaxy Nexus), it pop up a message saying "unfortunately, your app has stopped running." Hi Jaden can you paste your error log here? Well this camera code have issue with samsung gallexy series mobiles. Actually because of good quality high resolution image data got null in OnActivity Result..
that mean something wrong with your code, have you declare SimpleCameraGalleryDemo in your manifest? or package name or file name is change.. Please copy whole project with same class name and package name..
and one more thing let me know your app crash on open camera or on launch your app? Ok. i will try it out. It crashes when i launch the app. Hi, I am able to crop now but its only select from gallery. However, when i use camera and take a picture and try to crop it, the app crashes. It is the package name - SimpleCameraGalleryDemo - name conflicted. I solved it as you said and manage to select from image gallery and crop it. However, when i select camera, it crashes. And for the above code you gave it to me.... where do i place it in my coding? logic is that- Samsung Gallexy serise mobile have good quality of camera so their size is also big that's why we got data==null in OnactivityResult. 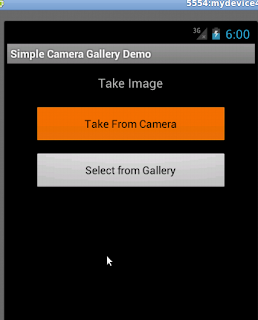 for avoiding this issue get last image capture location in your memory card and convert it into bitmap. Do i add the above given comment code into the OnActivityResult method for camera?? and replace with the old ones that were given in the post? I apologized, i am just confused about the coding for the camera. just change whole onActivityResult with new one..
Can you please tell me how to remove the spacing from image, that is when I capture image onResult the image is set but there is spacing in background, so how could I remove it? This spacing because of cropping image I mean suppose you capture an Image size of 480*720 and after that you crop it just half 240*360 that's why you are getting black dark shade in background. For this you should check device resolution and crop image according it..
Well if you got any better solution please let me know and please publish you comment on my blog so other user can get help from you..
hi may i know what is the problem that occurred, when i run your app, everything is fine. Until, after the crop section. The cropped image does not show up at all. Let me know please which device you are using for testing may be it happens because of high resolution image. May be your device memory size is less so you did not got any thing..
and please cross check for camera and gallery in both case you are getting same issue? hi manish, i am using a galaxy nexus. yes may be remove some app from your phone and try again..and yes you are right problem is the high resolution image. Please try to debug code using debugger I think you got null data that's why not able to get image after crop..
and one more testing remove crop code from your project then try again..
hi manish, sorry for this. but i am a beginner programmer for android apps. erm.. i did remove the cropping code but it still does not work. now i try checking for null data but it says imagebyte is not used. In my code i want to use gallery but one problem is that get images from drawable and crop it and set as wallpaper so can you please help me?? I got code but when store in sd card image will going to distorting. I have one code but in that when i crop image and store it into sd card then it will be blurry so not able to set as wallpaper. yes dear after crop image it will got blurry in this case I can't help I think don't crop more or try perfect ratio to crop image..
As you can see your data is null that's why your application got crash.. I think you are using Samsung phone for testing. In High Density device image size is big so we got data==null. for that just capture image and get last path of image and crop it..
i have a problem, how can i save the image that has been crop into my phone gallery? I've tried the code on sony xperia s with android 4.0 it works without error. Yes Firas you are right I have also same issue its work on some devices and failed on some.. I think it is because of high resolution image.. Please try it on google..
and the galaxy s is 5mp. I tested it on HTC 4.0 and Samsung Gallexy S Dues and its working fine.. Please check on google and if got answer please paste here so other people got help from you..
search it on google- "stack overflow question number 14534625"
hi, can you tell me, how to pass the cropped image from one activity to another activity? thank u so much.. it's working. i did a small mistake. thanks a lot..
hello manish..thanks for sharing a nice tutorial on image cropping in android..im new to android can you help me in my projects...some guidance im stuck up in some parts.. Yes sure i you have little issues you can ask..
How do we crop an image if we have it's path ? In one of your replies (http://www.androidhub4you.com/2012/07/how-to-crop-image-from-camera-and.html?showComment=1361894006692#c1709361995420601649) you explained how to get the captured image path, could you please explain how to let the user crop it ? Hi this is normally not happen so you can use canvas for it. After cropping image i want to upload to server and get link of that uploaded image. But when crop and press save it just give crop image. How could i upload it? Hi after cropping don't set your image in any imageview, just call web services for upload your image on server..
Do you know how to get the coordinates(X,Y,H,W) of the cropped image? In my knowledge we can't get coordinate of crop image but we can set coordinate. This is really a great tutorial, I have searched over a lot of websites and finally landed up here. My requirement is to take a picture and crop it and show it on the ImageView. With your code, I am able to take the picture, but upon confirming the picture, the app is crashing. But, The cropping and displaying of image from gallery works fine, though my requirement is to capture and crop the image. Can you please guide me where i went wrong or what is problem? Thanks for comming here and share your problem with me. Actually you are not doing anything wrong. problem with android OS. In market many size and many company devices and they have their own camera resolution and their own way to override android OS. I also got stuck same code working fine on HTC device and some of Samsung device but some of Samsung device have issue. I am using Samsung gallexy s-dues, HTC Desire and its working fine camera and gallery both but one of my friend have samsung device and I am getting crash on Gallery and on one of my user having crash on Camera.I am really got stuck. I don't know why Android allow to override OS like that. Actually problem is data when you are call camera or gallery Intent and getting in onActivityResult() data came null, that's why application got crash. Well If you don't want crop Image you can get it using it's path and display in Imageview. Please discuss your views, sure I will help you. This code looks awesome,do you know how to give overlay points on the image so that image can be cropped as per the points boundary...something like camscanner android application.Do help me with your answer. I think you should use canvas. It will help you to crop image in custom ratio like-circle,square etc. Hi Manish..i would like to say thanks first for ur post..its helping to me ..but when i m taking image from Camera i am unble to crop it app is crashing ..cuold u please help me..
hi, how can i get the best result of cropping image, so that the resolution of cropped image same as original ( quality).. Suppose you have imageView of size 200x200 or you want send that image 150x150 size on server so crop that image in that ratio else it will be blur. ok...i have done this....thank u so much. there is small problem everything work fine but when we press the back button(after the cropping option) on the mobile, appilcation crashes. after cropping when we press save or cancel it is fine..
i think you got my problem......could you please help. i am not sure but i think it should work please check and update me.. I want to crop an image in my application when it is selected from gallery.My cropping code work from the simulator but not properly work on phones. I set outputX=400 and outputY =487. In my simulator i get the output bitmap with 400 x 487 resolution,but when i cropped the image from gallery i get the output bitmap with 145 x 177 resolution. Why does it happen? it is because of device density. It will be different-different on different devices. how can I get picture Height and Focal length after cropping? Thanx for helping so many with ur code.Ur code worked fine for me.One prob is zoomin/zoomout is not working when resizing the crop frame in gallery picture but the same is working fine when clicking picture from camera upon resizing ZIN/ZOUT option working..Plz help me what can be done..Thanx in advance. So Simple just setonclicklistner on that imageview and on click open the camera and onActivityResult set image into imagview. Thanx for the reply. I dont get you.. ur answer is not relevant for my question.If u run ur code..u l get to know while cropping image is zoomin/zoomout when u click picture..but when u select picture from gallery ZIN/ZOUT not happening while cropping. We have same croping code for both. So it should function same as well camera and gallery both. Its not working the same way when i exactly copied ur code.U can also try and see. I have got problem for crop image. In Samsung galaxy tab , the selected URI give as null pointer exception,Please give me suggestion. Thanks a ton brother ! I don't have words to express my gratitude towards you ! Just thanks a ton again ! Bro. I have just a small query ! if i set an image to this image view created as per your algorithm.. How am I suppose to save it and retrieve it during the app start and app close ?? Could you please help me on this ... eagerly waiting for your answer.. I have used your code.its working fantastic but In my application i need to upload the image with 100*100 size. How can i crop to this size. and use finalImage for sending image over the server. I am not sure but it should work for you. hiiii manish your code run my samsung galaxy grand but when i run it on other devices like micromax and huwai it crashes while taking images and on save on it. After capturing image from camera I want to set the same on imageView of resolution 300x246. I have used you code it is working for me but I am not able to use the same as per my requirement. Can you please provide the solution for the same. Thanks for this brilliant post!! It has really helped me. I've a query which might be out of the context of this development, but I would really appreciate if you could help me with that. I want to change the value / text in the buttons of 'Save', 'Cancel' and 'Crop' after a picture is taken from any Android device (samsung especially) and the result outcome as well. What happens in my app is, when you take a pic, you get the options to Save and Discard (I want to change the Save to Next). Once you Save it, you land on the Crop screen where you crop the intended image and press Crop. After the image is cropped, you again get the options to Crop or Cancel. At this stage, I want the options to be Done rather than the Crop and Cancel. Once Done is pressed, the cropped image is taken to my app screen. I tried looking for this in the Camera API, but couldn't get anything from there. Hope you could help me with this. Awaiting on your expert advice. Thanks!! Hi, this is android manufacture default feature, you can't override it. you need to implement your own surfaceview for custom requirement. you can try any cropping library too. When I run this, the program exit with [gallery has stopped] error. When I am using this code on my Galaxy S5 device after image capture I will go to image crop view that's right. But on my Galaxy S5 after image capture I will go to image save option view . I want after I've selected a picture (or taked a picture) to share this with differents services like G+/fb/email/sms/snapchat/twitter/other. I'm not abble to do this alone. Can you help me à little please ? I have executed this code but while I am executing this code I have an error when camera is opened as "Unfortunately stopped". Nice Tutorial, but can you tell me why it's forced close everytime I take from camera, but it's works when I import from gallery. Nice Tutorial, but when I select an image from the gallery, the main activity is opened and no cropping option appears. What do I do ? can you see the image on main activity? If no it's mean you are getting null as data on your onActivityResult. For that I will suggest to use URI and set into Imageview. nice work,it worked for me,but in my app I have crop an image already there in activity on click of button I have to crop that image.Can u help? I am not getting my image on image view after clicking save button.plz help me out! I want load image from Gallery and Camera or a url. please help for set mSource is in String format. some device not work in crop image. I test motoe and asus.